As you read this there is a hurricane raging somewhere in your life, or there is one looming on the horizon. It may not be the same as mine. It may not be the same one that rocked your life yesterday. It may belong to someone close to you but because they are a part of your life you will be pulled in anyway. As long as we live in this life there will be hurricanes, but they need not rob us of our peace. 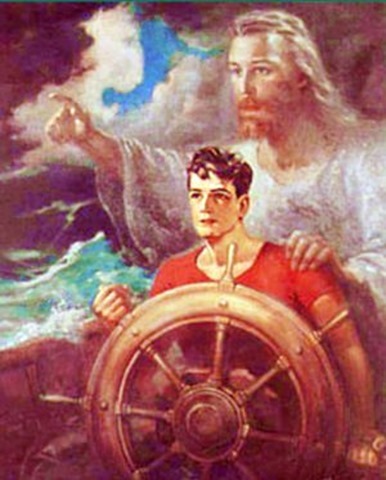 Each hurricane is but an opportunity to draw closer to Jesus, the undeniable Master Seaman, the Divine First Responder. Huge waves driven by hurricane force winds lift your fragile life high into the stormy sea. Standing tall at helm you desperately steer away from the hurricane but in the darkness you become disorientated and lose your bearings. Hovering very close the spirit of doom holds you and begins to slowly squeeze away what little strength and motivation you have. Suddenly a bolt of lightning flashes across the sky momentarily illuminating what seems to be certain death. Viewing the eerie scene instantly your determination to go on is renewed and valiantly you struggle against the raging storm. But with each flash of lightning, with each roar of thunder your resolve weakens and is carried away by the winds. Suddenly from deep inside the hurricane a faint voice calls out, “I tell you these things, so you will know in me you may find peace. In this world hurricanes will seek to subdue you and you will have troubles, but lift up your heart for I have overcome the world.” The voice is quickly stilled as the hurricane lashes out harder and harder relentlessly seeking to pull you into its death grip. In spite of your resolve to go on you continue to weaken as you desperately fight and your eyes begin to sting from the constant pounding of the rain and wind. The voice a second time penetrates the noise of the pounding waves, the howling wind, and rolling thunder, “Come to me all you who are ravaged by the hurricanes of life and you will find smooth sailing. Put your eager craft in my hands and I will guide you into the eye of the hurricane where you will find rest, where you will find peace, where you will find me.” Reluctantly you take your hands away from the helm and the hurricane continues to rage but instantly you can feel the presence of another person standing behind you and suddenly you can feel arms encircling you. With precision maneuvering beyond what you’ve ever experienced your fragile craft begins to twist and turn with the hurricane as it is guided by the Master Seaman. No longer are you rocked back and forth, up and down, no longer does the raging sea pose a threat. “I have come so you may life, and have it abundantly,” the Seaman whispers to you. In distance there is a faint light and with each turn of the helm it gets brighter and brighter. Suddenly the wind begins to subside and waves disappear, the dark storm clouds dissipate and sun begins to shine and the sea becomes calm and the water becomes like a mirror reflecting the warm rays of the sun. You begin to feel peace such as you have never felt before and your strength begins to build rapidly. A forth time the voice sounds out, “It is finished.” Suddenly you are alone standing at the helm as you look over your shoulder you can see that hurricane still rages behind you. It is then you notice a man standing on the water waving at you, your eyes are drawn to the scars on his wrists and the man disappears into the hurricane going on another rescue.